The day three (3) of the 2017 Lagos International Badminton Classics has left delirious fans and Badminton enthusiasts at the edge of their seats and wanting more as it culminated to be the most exciting day yet for the four day international challenge at the Molade Okoya Indoor Sports Hall, Teslim Balogun, Surulere. 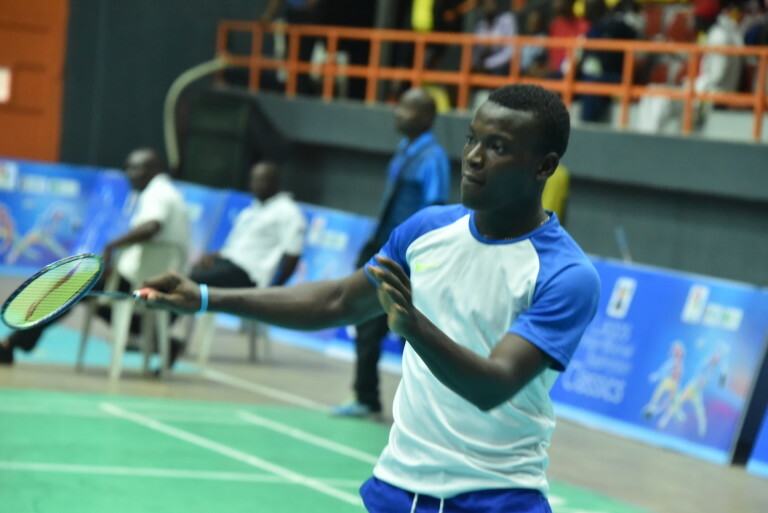 Lagos and Nigeria’s remaining hopes in the men’s singles event, Anuoluwapo Opeyori, was eliminated in the quarter finals by arguably, the most impressive player thus far in the competition Chittaboboina. Like eating a biscuit and faltering in predicting where it cracks first, the third day witnessed by far the highest degree of upset after top seed in the men singles category and former winner, Misha Zilberman, was knocked out by tournament 4th seeded Egyptian and Anuoluwapo’s nightmare—Chittaboboina in a thrilling three set encounter(21-13, 22-24, 21-14) to reach this year’s final. Some of the biggest highlights in the women’s category saw Nigeria’s top seed and tournament’s 8th seed, Dorcas Adesokan knocked out by Mugdha Agrey of India; 21-10, 19-21, 21-12 in a keenly contested three games. Nigeria’s nearly dashing hopes in the competition bumped to live again in the female doubles and men doubles categories . In the men doubles, the duo of Anuoluwapo Opeyori and Godwin Olofua ran away in a rather emphatic fashion in two straight sets, thrashing their Egyptian opposition, Abdelhakim and Ahmed Salah 21-10, 21-16 to progress to the finals—an unprecedented feat for the duo. Also, in the female singles category, the impressive Nigerian pairing of Zainab Momoh and Ramatu Yakubu defeated Sri Lanka’s Hendahewa and Ishadika Kavidi in a nervy three set encounter—14-21, 21-18, 21-15. In what was one of the best come backs of the championship, the Nigerian women doubles duo fought back into the game in second set after losing the first set and then showing some class to pip their opposition from Sri Lanka; -1-2 in major scores. The fourth and final day of the biggest Badminton tournament in Africa—the Lagos State International Badminton Classics would see all the action climax with plenty of giveaways for keen fans which includes a return ticket to London and Ghana.